Overlooking the majestic Sandia Mountains just minutes from Albuquerque Airport Sandia Resort and Casino welcomes guests to a unique Southwestern setting with outstanding service and modern comforts. 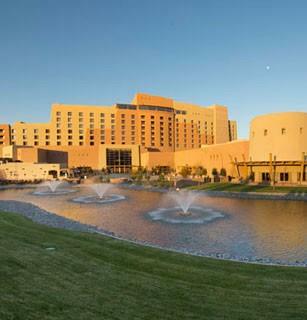 Upon your arrival you will be greeted by our distinctive porte-coch re entry and magnificent grand lobby which boasts stunning mountain views along with original photographs and artwork that celebrates the region s rich pueblo heritage. Your experience begins in our enchanting guest rooms and suites each showcasing breathtaking mountain or skyline views along with lavish bathrooms flat-screen televisions and complimentary high-speed wired and wireless Internet access. You ll also discover the thoughtful services and amenities that have made us a stand-out destination among Albuquerque hotels including our sparkling outdoor pool and cabanas live entertainment and tranquil spa. From fine dining to snacks on the go our diverse restaurants and lounges always deliver a memorable meal even to your guest room with our convenient room service offerings. Overlooking the majestic Sandia Mountains just minutes from Albuquerque Airport Sandia Resort and Casino welcomes guests to a unique Southwestern setting with outstanding service and modern comforts.